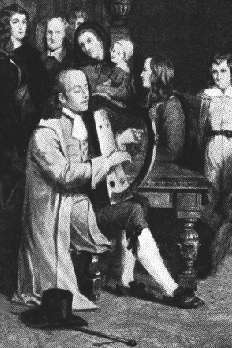 Turlough O'Carolan (1670-1738) takes up a special place in the succession of itinerant harpers, being one of the last composers in the great oral tradition. He "never excelled as a performer", as said Bunting, but showed as a composer an amazing gift of creating melodies of his own, of which over 200 have survived. He had opportunities, at this time of Irish history, to hear Italian music and even to meet Italian musicians. His music, unique and instantly recognisable, is influenced both by the Irish harp tradition and the Italian Baroque, a result of his sociable and open-minded disposition along with his musical wit. The complex architecture of Corelli's music, for example, inspired him, but having no knowledge of harmony science, he seems to have transposed this complexity on the ground of melodic line. This produced such long and intricate - yet definitely coherent - musical phrases as in Lady Dillon or Sir Festus Burke. Lady Athenry Petrie says : this air "exhibits a greater gravity in character, and approaches more closely to the sober dignity of Corelli's gigas, than perhaps any other composition of Carolan's of the same class". James Betagh Composed in honour of James Betagh of Ballyhaunis, Co. Mayo. The Betaghs were one of the old Irish families transplanted to the West of Ireland during the Cromwell era. The source of this tune and its appended jig is a fragment of Carolan's music in the National Library of Ireland in Dublin, which is thought to be part of the 1748 publication by Carolan's son, in collaboration with Dr Delany, of his father's music. George Brabazon (2) Seóirse Brabston, of New Park, Co. Mayo. Only found in O'Neill's Music of Ireland (1903). Sir Ulick Burke A song composed by Carolan on his way to Glinsk, Co. Galway, the seat of Sir Ulick Burke, where, on his arrival, he was to learn his patron's death. Sir Festus Burke A very cheerful tune, on the same Italian-Irish design as the "Concerto", but less often performed. Dedicated to Sir Festus Burke, son of Sir Ulick's half-brother. Lady Laetitia Burke Daughter of the Earl of Clanricard, she married Sir Festus Burke in 1708. Planxty Burke Probably connected to another Burke family than the former tunes. Madam Cole 'One of Carolan's finest airs', in George Petrie's opinion. Composed for the marriage of John Cole of Florence Court, Co. Fermanagh to Jane Saunderson, from Co. Cavan, in the 1720'. Edward Corcoran Petrie, again : "I confess that it appears to me to be one of the finest examples preserved to us of Carolan's particular genius in this class of graceful and spirit-stirring tunes." Mrs Costello A very strange and plaintive tune. Lady Rose Dillon According to O'Sullivan, this Lady Dillon was the wife of Richard, 9th Viscount Dillon of Costello-Gallen in Co. Mayo. A very Baroque piece, with an appended jig. Luke Dillon Luke Dillon of Clonbrock married Honora Burke, sister of Sir Festus Burke. Mrs Edwards Probably Margaret Edwards, who married (for the third time) Lord Mayo, who was a friend of Carolan. Miss Fetherston or "Carolan's devotion" : Carolan met this young lady on his way to church service in Granard, and later, at Mass, "instead of praying for Miss Fetherston, as she requested, he neglected his religious duties to compose a song on her". It is said to be the only song for which Carolan composed words in English. Hewlett Here are some verses of this drinking-song. Mrs Judge Written for the wife of Thomas Judge of Grangebeg, Co. Westmeath. Mrs. Keel A slow and solemn air. Betty MacNeill A song composed for the daughter of Captain MacNeill of Ballymascanlon, Co. Louth. Morgan Magan Composed for Morgan Magan of Togherstown, Co. Westmeath, who died in 1738, and whose sister married Sir Arthur Shaen. Madam Maxwell (2) A second tune composed for the lady. Grace Nugent (Background music) - Written for the fifth daughter of James Nugent of Coolamber, Co. Westmeath. Mr O'Connor Same source as James Betagh. Maurice O'Connor Composed in honour of Maurice O'Connor of Offaly, who left Ireland about the year 1700, made a huge fortune in England as a barrister (after having embraced Protestantism), and came back to Ireland twenty years later, purchasing an estate (Coote Hall) in Co. Roscommon. The song celebrates his return to Ireland and this "Irish recovery". Denis O'Conor (1) A friend of Carolan, Denis O'Conor, of the house of Belanagare was of the lineage of the last High King (Ard Rí) of Ireland. Charles O'Conor Charles was the eldest son of Denis O'Conor. He was taught the harp by Carolan. Kean O'Hara (1) A drinking song composed for Cian Ó h-Eaghra (c.1657-1719) of Nymphsfield, Co. Sligo. Kean O'Hara (2) A second fine air composed for the same host. Owen O'Rourke Óghain Ua Ruairc was the head, in Carolan's times, of the great family of O'Rourke, Princes of Breffni, the last of them who lived in any opulence, according to Mulloy MacDermott. (see the O'Rourke site here) He lived in Tarmon, in the parish of Drumkeeran or Innismagrath, Co. Leitrim. He died on the 12th February, 1728. Mrs. O'Rourke Máire an chúil fhionn (Mary of the fair locks). It is said that Owen O'Rourke's wife felt much offended at Carolan not composing a tune for her, "after all her attention and kindness to him". So Carolan, who "always wished to have the ladies on his side", composed this song and regained her favour ! Frank Palmer Composed for Francis Palmer of Palmerstown, Co. Mayo. Tobias Peyton This gentleman happened to make fun of the "crooked" posture of Carolan riding his horse. Carolan took offence of that and promised a crooked tune, as a revenge on his patron : here is the result. David Power A friend of Carolan who lived at Coorheen House, near Loughrea, Co. Galway. Carolan's Concerto was composed in honour of his wife. Carolan's Welcome Attributed to Carolan. This title - and the next one - are rather dubious. Planxty O'Carolan From Francis O'Neill's Music of Ireland. Carolan's Cap Probably a nightcap, i.e. a last drink before going to bed. Carolan's Cup Not a tune by Carolan, according to Donal O'Sullivan, "at any rate in its original form, though he may have played it and slightly altered it. It is a well known folk tune, somewhat altered, entitled Ar bhruach na carraige báine or On the brink of the white rocks." Carolan's Maggot ... or Carolan's capriccio. The Fairy Queen Bean riogh na síbhruíne. According to Bunting, Carolan has only adapted and expanded an original and ancient air named "My love and Treasure" or Ciste sa stór. (Lyrics here). The Landlady First verse of this song here. Sheebeg and Sheemor This tune is said to have been Carolan's first composition, at the age of twenty-one. The song is about a battle fought between Daoine Maithe (good people) from two neighbouring hills, Sigh mór, and Sigh beg, in County Leitrim. on the Refusal of his Halfpence A satirical tune composed at the occasion of the general boycott against a patent granted by the English Government to William Wood in 1724, allowing him to mint copper coinage (umha bog or humbug) for Ireland. "The Drapier's letters to the people of Ireland, concerning Mr. Wood's brass half-pence. Together with considerations on the attemps made to pass that coin. And reasons for the people of Ireland's refusing it ." "CAROLAN : The Life Times and Music of an Irish Harper", London, 1958.